If you read the ingredient list on some of the most popular cosmetic brands, one ingredient you’ll see often is dimethicone. But what is dimethicone and why is it used in cosmetics? Dimethicone, also known as polydimethylsiloxane, is a silicone-based organic polymer. It’s essentially a lab-produced silicone oil considered generally inert and non-toxic. Dimethicone exhibits some interesting properties, and it feels incredibly slick. Although it’s a silicone oil, it feels strangely powder like. Its lubricating properties are so amazing it gives cosmetics a powder-like finish! As a Cosmetic Formulator, dimethicone is an exciting and interesting ingredient. Not only does it give hair and skincare products that powdery-soft, slick feel it also is an anti-caking agent. It feels amazing on the hair and skin. While there is some negative information about this ingredient out there, if you read studies and good scientific articles about this ingredient, you’ll find that most of the readily available negative information is based on fear rather than fact. I personally love using this ingredient for the way it feels and performs! 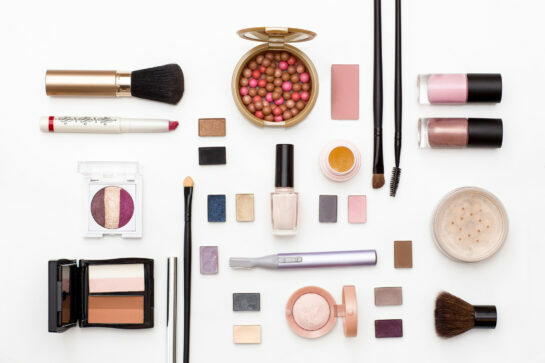 Ready to create your own amazing, powder-soft cosmetics? Check out this fun recipe! This gel to powder is the perfect addition to your make-up routine! The soft and cool feeling of the gel in the container changes to powder perfection when applied to your make-up brush and skin. Use as a highlighter or setting powder! Mix all ingredients in your food processor. You may need to use a spatula to scrape the sides of the processor and mix again. Mix until your have an even consistency throughout. Press powder firmly into your makeup jar. Use a brush or sponge to apply as a highlighter or setting powder.